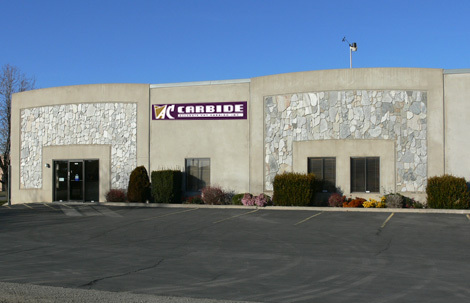 Accurate Cut Carbide, Inc. opened for business, January 2nd 1990 in a rented 1,100 sq. foot office warehouse in Salt Lake City, Utah. After 18 months and many satisfied customers, a new 10,000 sq. foot building was constructed at our present location in North Salt Lake, Utah. We moved to our new facility November, 26th 1992 with five employees, and we still have five employees today, with a range of experience from 12 to 20 years. Accurate Cut Carbide, Inc. has stayed on the leading edge of the industry with the latest high tech CNC equipment and technology. Our customers come from all areas of the United States, including Hawaii. We are the preferred sharpening service in Utah. With the worst recession most of us have seen in years, we are all looking for ways to control our costs. Two ways we can help, is properly servicing your cutting tools (saving your production time) and helping you find the proper cutting tools for your application. Controlling your cost could be a large factor in your success. Let’s start with Tool Management, a very important part of manufacturing. Tooling needs to be managed because it is one of the most important parts of the end product. Modern tooling is designed for specific applications; “the one size fits all” approach is not cost effective. Properly sharpened cutting tools gives better cuts, longer run times, less down time, and longer tool life. Companies spend hundreds of thousands of dollars on machines and then purchase inexpensive tooling for use on the machine. Quality tooling maximizes the performance of your expensive machinery. Even the best tooling serviced by a cut-rate sharpening service will affect the life and performance of your machine and tooling. Today’s tooling is designed to give the best finished product for specific applications with minimum sanding labor. Tool managers have to know what tooling is needed for the proper application. Tool Management needs to have tight control on cutting tools. How often are tools sharpened? How many times can a tool be sharpened before it should be replaced? Is the tool replaced because of misuse or improper sharpening? Are tools properly stored when not in use? Are shipped for service tooling itemized on a purchase order? Is the tool doing the task it was designed to do? To be effective on saving you money with our services and products, Accurate Cut Carbide, Inc. would like to see management, purchasing, and shop personnel get involved in our services and costs. This helps everyone know what to expect so you are not paying for services and items not needed. To accomplish this mission, and save our customers money our business structure and operating plan is followed very closely. 1. Our machines are of the latest CNC grinding technology. 2. Our technicians are well trained and very knowledgeable with many years of experience. 5. We sharpen all items to manufacture’s specifications for longer cutting life. 6. We only remove the amount of carbide necessary to get the tool sharp (.004 to .006). 7. We serialize all saw blades and brazed cutters to keep track of times sharpened. 9. We manufacture carbide inserts, and can duplicate your inserts to save you money. We can also sharpen some inserts for half the cost of new inserts. 10. All our CNC machines grind with oil coolant, for a sharper cutting edge. This gives you cleaner cuts and longer run time before tool changes. 11. Saw blade sharpening on 10” to 12” blades average 12 to 16 times per blade. Panel saw blades 450mm to 600mm average 18 to 24 times, and picture frame blades average 20 to22 times. 12. We give our customers a numbered receipt for all items pickup for service. 13. Our invoices are easy to read and show the cost of each item to give you better cost control. Each invoice has the receipt number on it of the receipt it was written on. Accurate Cut Carbide, Inc. business ethics works on integrity, and honesty. Making us a part of your business team will maximize your efficiency, cut overall costs and add to your bottom line. Something we could all use in a soft economy.